Mobile and Tablet Internet Usage Exceeds Desktop for First Time Worldwide — StatCounter data indicates that just over 51% of Web usage in October 2016 came from mobile devices rather than desktops. A Lap Around Push Notifications — Simon MacDonald and Sam Basu discuss best practices when using push notifications in your app and Simon’s involvement with Apache Cordova. 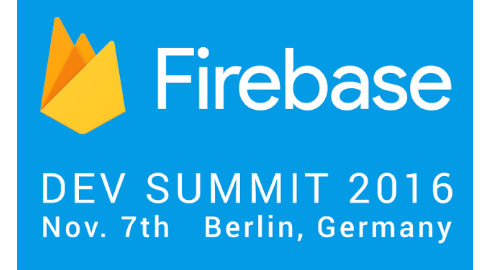 Join the first ever Firebase Dev Summit via Livestream on November 7, 2016 — Firebase Dev Summit will feature a full day of talks on topics like Developing Rock-Solid Apps with Firebase, Firebase for Games, and Action-Packed Analytics. All sessions will be livestreamed from our website on 7 November. Sign up here to receive updates about the event. Google Is Making It Easier for Anyone to Design Beautiful Apps — Google is launching a number of Material Design tools that are not necessarily specific to native application development. In fact, Remixer specifically offers an SDK for web. Firefox Disables Loophole That Allows Sites to Track Users Via Battery Status — Mozilla has cut access to the battery status API feature, which allows sites to request capacity information of a visitor’s device. Cordova Tools Update — A new version of Apache Cordova tools has been released with new features, fixes and more. New to the Command Line? — A walk through of Ionic’s command line tooling for any developers not typically comfortable on the command line. Implement Social Sharing with Ionic Framework V2 [RC1 Updated] — Adding Social Sharing to your apps with Ionic. NativeScript for the .NET Developer — Why .NET developers may feel comfortable building mobile apps using NativeScript despite the lack of C#. 6 Technologies App Users Will Expect You to Consider in 2017 — A list of technologies you should be considering for use with your mobile apps in the near future. The State of UX in 2016 — The results of a recent study revealing how different organizations are using UX today. 12 Tips for Mobile Design — Nick Babich shares a dozen UX design principles to consider when creating a mobile user experience. The Next Gen Web: Scaling Progressive Web Apps — This case study covers how Flipkart.com redesigned their site as a progressive web app, whilst dealing with the unique challenges of scaling to a new ecosystem without compromising on performance. Welcome to Verge 3.0 — It appears that more and more companies that rely on syndication (like The Verge) have bought into Facebook Instant Articles, Google AMP and Apple News. Get Started With React Native Layouts — Learn how to lay out React Native apps and how to implement layouts commonly used in apps. Find Your Perfect Fit - Try Hired — Finding the right role can be daunting, but not on Hired. Get empowered to find the right role with multiple job offers and free personalized support.